When you have a sick child in the house or family member what is the main thing you always need to have on hand? A trust worthy accurate thermometer that you know will work the first time. I have fought with my son when he was a infant to sit still long enough to hold that little thermometer under his arm. He would scream and cry from me holding him still and I would get frustrated because it wouldn’t work fast at all! 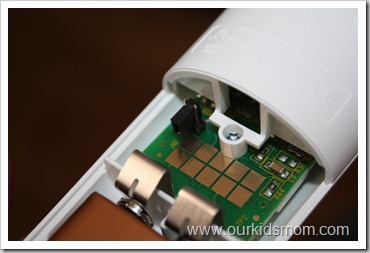 When your child is sick you want that temperature fast, accurate and easy. The Exergen Temporal Scanner is the answer to everything you would want in a thermometer. With a quick 3 second scan across the forehead the thermometer reads with am advance infrared technology that gives you a quick, consistently accurate measurement. “The Temporal Scanner Thermometer has been clinically tested for accuracy compared to rectal thermometers and temperature sensors inserted in the heart during the course of patient treatment and accepted for use in major hospitals” The scanner is designed to read the temperature of the skin directly over the temporal artery for the most accurate reading. I have found this thermometer to be fast and easy to use. Both of my kids actually enjoy having their temperature taken and will bring it to me and ask me to take their temperature. To use the thermometer you place the head flat against the forehead and hold down on the button, then moving the thermometer across the forehead you will hear a triple beeping when it is done reading. The display is clear and easy to see and read. If you remove the battery cover you will find where you can change the reading from Fahrenheit to Celsius by simply adjusting a black little probe inside. 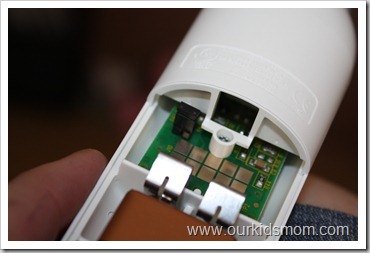 When the thermometer is not in use it comes with a cover for the head to protect the sensor from being damaged while being stored. 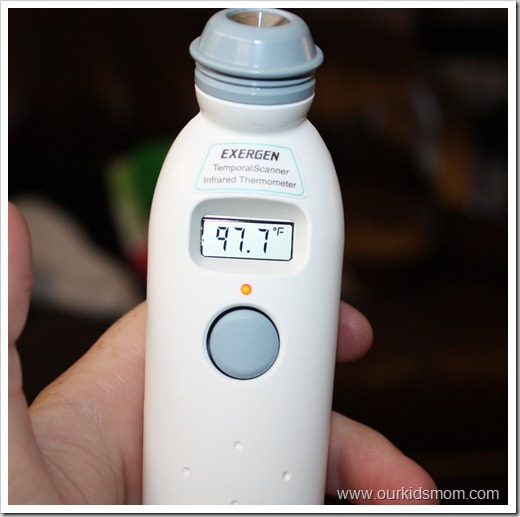 I would absolutely recommend the Exergen Temporal Scanner to anyone who is looking for a great accurate and affordable thermometer. I love how easy it is to use. This would be great when checking on sick little ones at night. You don’t have to wake them to get a temp! THis would make life so much easier!!! I learned that Exergen TemporalScanner Thermometer is the Best Selling Thermometer at Retailers for the Third Year in a Row. Wow, what an incredible device. Having one at home would make life so much easier especially at 3 o’clock in the morning. The accuracy is a selling point for me. Thank you. I learned that “it takes 1,000 readings per second and selects the most accurate.” I love that it is “almost impossible to miss the temporal artery during scan.” I have a MOBI temporal or ear thermometer, but depending on where I place it, the temperature varies almost an entire degree! I like that it is incredible quick with results. I like that it scans and you don’t have to fight a child to hold it under arm, tongue etc. I learned just how accurate it is…even though it doesn’t take long. I learned that it’s been #1 three years in a row. Second, at the same time, a patented system measures the ambient temperature of the site where the temperature is being taken. The patented “arterial heat balance” (AHB) software then synthesizes the two separate readings to accurately determine and display body temperature. I learned that the Temporal Scanner Thermometer is designed to measure the temperature of the skin surface over the temporal artery, a major artery of the head. This would be so great. My daughter is so wiggly and it’s hard to get her temp when she doesn’t feel well. This would have come in handy this week! BOTH of my girls have been sick since Friday. I learned you can ask your pediatrician for your TAT-2000C Educational Pamphlet which includes a $5.00 (mail-in) rebate coupon good toward your purchase of a TAT-2000C ComfortSCANNER™ or TemporalScanner™ Temporal Artery Thermometer. I like that they have teamed up with Nascar…very cool…this is the first I have heard of them. I love that it will give you results in 3 seconds. These are sold at walgreens! I wish they would have this when my children were small! I like that the site has so much information on how to use the scanner appropriately. Exergen TemporalScanners are now used by medical professionals approximately 700,000,000 times per year, and by consumers approximately 100,000,000 times per year. If medical offices and hospitials trust it to use it this much I would love to have it. I have loved this thermometer ever since I saw the nurse use one on my son when we were in the hospital. It is so quick and easy to use! Would love to win this! Exergen provides temperture sensors for NASA! I learned that the best place to measure temperature is the center of the heart. I love how easy it is to use on a sick kid. I learned that it is the best selling thermometer! I learned that Arterial temperature is the same temperature as the blood flowing from the heart. It is the best determinate of body temperature. I like the looks of this thermometer. Their products are sold at Walgreens. I learned that this thermometer scans like a video camera, capturing naturally emitted infrared heat from the arterial blood supply at about 1000 “frames” per second, locking in the highest temperature it senses. I like that you can take a sleeping child’s temp, without disturbing them. I love just how easy this thermometer is to use! I learned that these are available at Walmart. I learned that it’s accurate. I had previously heard that these types of thermometers weren’t very accurate. I think it’s great that it has been #1 three years in a row now! I learned I can buy this at Walmart. Exergen Corporation is the recognized world leader in industrial and medical non-invasive temperature technology. And you can buy it at walmart! I learned and love the accuracy that it has since it’s almost not possible to miss the temporal artery. 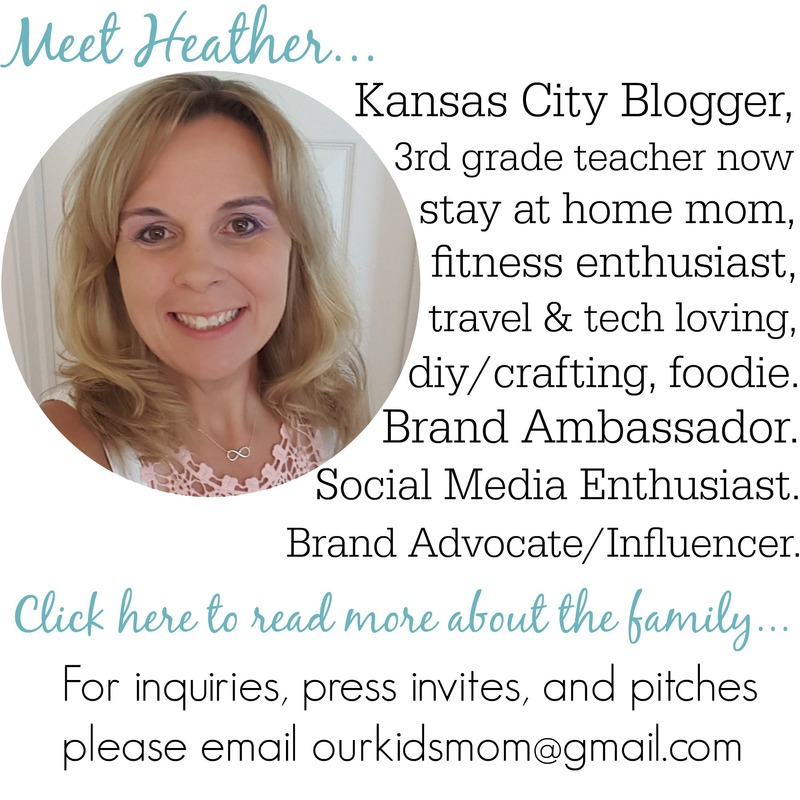 this is a must for any mom! I learned the TemporalScanner has patented software, providing arterial heat balance. This unique process determines temperature by accurately measuring the balance between the tissues warming from arterial blood and tissues cooling (warming) caused by heat loss (gain) to the environment. They make all kinds of thermometers – even industrial! This is a great item. I love how easy it is to use. i really would like to try this thermometer.i have tried quite a few and had so many issues with inaccuracy.this one seems awesome! I learned it takes 1000 readings per second! I love how easy and accurate this is- much easier to use on a cranky toddler! 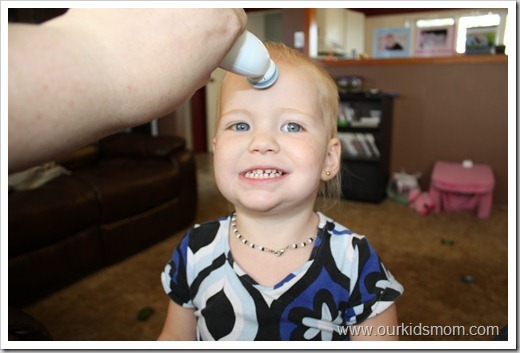 Love that it is non-invasive — so much easier to use for kids! I learned that the temporal artery thermometer scans the forehead area for the temporal artery and it is almost impossible to miss the artery during a scan. Thanks! Hank uses one in Royal Pains! Wow what a cool school nurse toy! I liked that the site was very informative and had tips for helping kids 🙂 ( I’m not sure if any of my comments are going through…I hit submit and nothing happens…when I hit it again, it tells me I’m submitting a duplicate?) I hope these are going through and I don’t end up getting disqualified..lol.. I learned that there are two. Erosions of the scanner, a professional one and a at-home version. Can be purchased at Target, Walmart, Costco, Babies R US, etc. Its been number one three years in a row.. Thats very impressive to me. One of the Exergen Industrial Sales Reps/Technical Consultant won a NASA Patent Release Award. 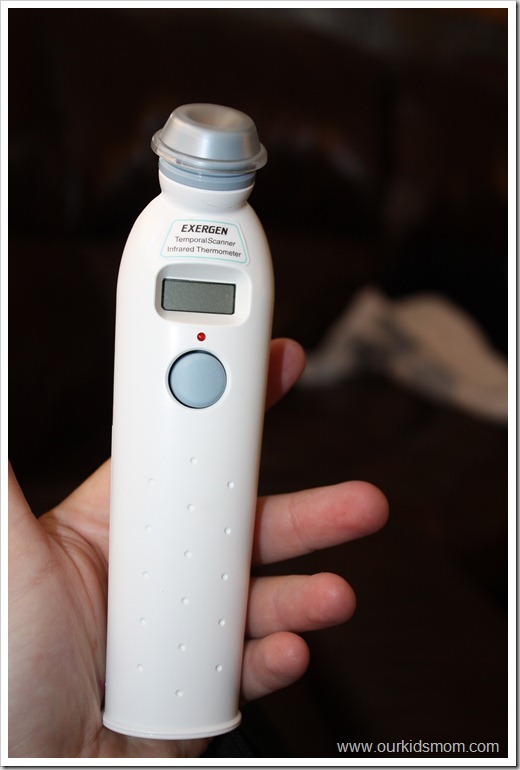 It is the most accurate and painless way to take their temperature, even while sleeping. the temporal scanner is really neat. I really want one or two of these thermometers, I would love to have one at home and in the diaper bag at the very least! I love that this takes all the difficulty away of having to wake up a sleeping child to take their temp! I love how accurate it reads and it doesn’t bother your kids ears like the current one we have. It’s fast,easy to use and as accurate as a rectal thermometer.Im a nurse at a nursing home and its much easier to use one of these. I like their virtual classroom and many different languages! nice that it’s fast and sanitary. would love to have one. I love the ease of use. It would be perfect for my babysitter! I learned that Exergen holds over 100 issued and pending U.S. and foreign patents, and is the only manufacturer of retail medical thermometers in the U.S. I really want the Model TAT-2000C. My kids hate it when I stick the thermometer in them. Exergen uses technology employed in many hospitals to provide accurate temp readings…I’d really like to try it! Learned it is the best selling thermometer at retail locations for the third year in a row. It is the best selling thermometer three years in a row. Interesting that they were the first to creat a temporal artery thermometer. Means they know what they are doing. It’s so easy to use! There’s a reason why it’s a best seller. I learned you can buy it at many stores including Target. I like that it is noninvasive and so quick. Thanks for the chance to win! I like the fact that this thermometer is easy to use and I don’t have stick the temperature probe inside an ear, up some bottom, or in someone’s mouth. I’d love to have another thermometer, so I could give one to my children’s daycare. I didn’t realize how accurate they really are! I don’t remember them beingas quick and accurate, this will definitely be a purchase for #2! I learned that pediatricians prefer temporal artery thermometry over rectal thermometers! I love how unobtrusive this makes taking a little one’s temperature. I like that I can take my child’s temp without waking him up! I learned that they make temperature sensors for NASA. I think it is great they have a virtual clinic on the website. It will help people learn how to use correctly. I learned that it was named one of the smartest products of the decade! I learned they have a guess the game time temperature giveaway going on. Doctors prefer this thermometer to rectal thermometers! I have wanted this themometer since I first them use on my twin lil boys. Now it seems those cute wonderful little suprizes won’t let me take a digital thermometer near then let alone try under the arm. And if you can imagine me chasing and holding down two 2 1/2 toddler boys to get their temp. If it wasn’t so bad(because its needed for their wellbeing) it would be youtube worthy…..
Twin B (Aiden) just woke up and not feeling well, I sorta figured this, I’m off to chase Aiden to take him temp he surely will have one. This is actually why I was sitting here doing the research on the exergen temporal thermometer, thought I would need it and I want it….enjoy your day parents! I learned that the Exergen Thermometer is available at my nearby Sam’s Club. I learned how easy and accurate it is! Sounds great! They publish studies where doctors prefer it – if they do, it must be great! it’s been #1 three years in a row. I learned that Exergen TemporalScanner Thermometer is the Best Selling Thermometer at Retailers for the Third Year in a Row. Thanks so much for the fantastic giveaway! #1 best selling brand at retailers! I learned that pediatricians prefer temporal artery thermometry over rectal thermometers. I love that it is recommended by Pediatricians. My daughters’ ped loves them and uses them in her own practice. They are so quick and easy. What a much better method at 2 AM with a fussy kid than struggling with taking their temp orally or rectally! I learned they make products for pets too. Surprised to read that these temporal scanners appear to be just as accurate as traditional thermometers and they actually have research to back it up. I’ve got a sick 8 year old right now. I couldn’t find the thermometer this morning. Sure could of used this! I love that it is convenient and easy to use! They made the first ear thermometer in 1991. Found out that they are a lot lower cost than I thought. I love how fast and accurate it is at taking the temperature. Thank you for the chance to win. 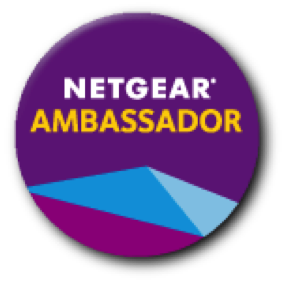 I love that they are now offering a $5 rebate to consumers that purchase this product! 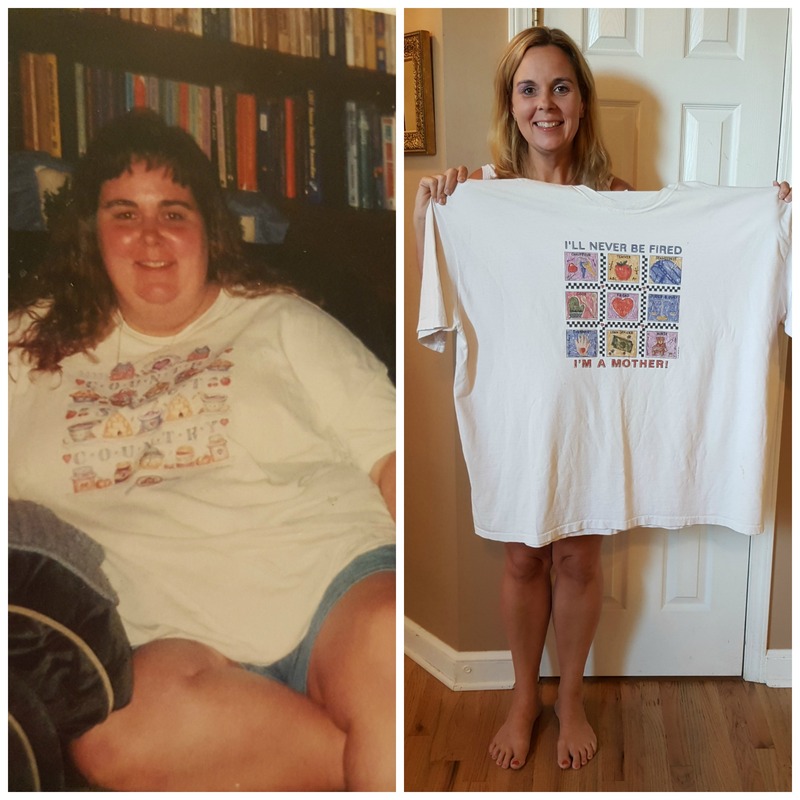 I learned Exergen TemporalScanners are used by medical professionals approximately 700,000,000 times per year, and by consumers approximately 100,000,000 times per year. If sweating, the temperature on the neck behind the ear lobe becomes the overriding temperature, and since this area is not quite as stable as the temporal artery, it can easily cooled be by the thermometer in taking multiple readings. Remember, the probe of thermometer will be at room temperature, and is about 30 degrees Fahrenheit (17 degrees Celsius) cooler than body temperature. I like that it is fast, non-invasive, and accurate! This would be so much easier than trying to hold the thermometer under my little one’s arm for several minutes. I learned that the corporation is based in Watertown, Massachusetts, USA. i would love to have this. It would make my life a little easier when it comes to taking temperatures. I found the following to be very informative: The temporal artery is connected to the heart via the carotid artery, directly leading from the aorta, the main trunk of the arterial system. It offers constant blood flow. It is the only such artery positioned close enough to the skin surface to provide access needed to take an accurate measurement. I learned that Exergen is the creator of the first temporal artery thermometer! I learned it has great ratings … I used to be a cna and we used these with our residents. They are so easy and accurate! A great product!! I like this thermometer because it scans the skin over the temporal artery. As a respiratory therapist I know the temperature of the blood in an artery is very accurate, as a Mommy I love I don’t have to probe my already miserable baby! Great product! I learned that Temporal artery temperature is not affected by the things that cause oral and underarm temperatures to be misleading. I learned that Exergen TemporalScanner Thermometer is the Best Selling Thermometer at Retailers for the Third Year in a Row!! It was Founded by Harvard-research scientist .Dr. Francesco Pompei over two decades ago, Exergen Corporation is based in Watertown, Massachusetts, USA. I learned it only takes three seconds to record temp! I learned that this is the best selling thermometer 3 years in a row. I like that it takes a lot of readings to ensure accuracy. I love the ease of use and accuracy! I wish the hospitals could get on board with them! This would be awesome to win. Thanks for the opp. Exergen has a virtual classroom. I learned that studies show the accuracy of temporal artery thermometry for patients of all ages, especially the very young. What I would really like on the website is the Exergen Temporal Artery Thermometer. The accuracy and ease of using it is something I really need. I researched this thermometer a lot before buying it. It was recommended by my physician recommended it (preemie twins). I just need another one. My son took the thermometer and cooked it in the microwave (the battery was seriously smoking). Needless to say, the next purchase was a gate to keep the kids out of the kitchen. OMG, these are real! How do they work–like mom’s lips? It would be fascinating to use on of these thermometers. I didn’t realize how accurate these thermometers were. I like that I can buy it in local stores. I learned that arterial temperature is the same temperature as the blood pumping from the heart. I learned that temporal artery temperature changes faster than temperature taken rectally. This is so easy and great, thanks for the review and giveaway!! I heard that temporal artery scanner thermometer is really great. I wish I had this before when I was having my first baby.